You should now have some basic understanding of series and parallel circuits, but there is one aspect that hasn&apos;t been addressed yet. Why use a series circuit versus a parallel circuit or a combination of the two? Well, you already know the answer if you think about the quirks of both series and parallel circuits. Take the following example: You wish to attach some electronic component to a 12 volt car battery. What the component is does not really matter so we will call the component Z. Component Z comes with some specifications. It presents 4 ohms of resistance to the circuit, but more importantly, it requires a maximum voltage of 2 volts - any higher and the component might be damaged. So, how do you hook Z up to a car battery that is putting out 12 volts without damaging your component? The key to the problem is that you need to reduce the voltage across component Z. You should remember from the earlier series circuit tutorial that placing resistors in series creates "voltage drops". This is a simple way to reduce the original twelve volts from the battery down to the two volts you want. Placing a resistor in series with component Z should do the trick. We&apos;ll call that resistor Rx. But how large should Rx be? For the purpose of circuit analysis, we will treat component Z as a 4 ohm resistor called Rz. See figure Z above. First, we will focus on Rz. We know the voltage we want across Rz (2 volts) and we know the value of Rz (4 ohms). 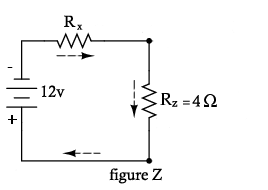 From this, we can use Ohm&apos;s Law to calculate the current across Rz. Using Iz = Vz / Rz we get Iz = 2 volts / 4 ohms = 0.5 amps. Since the current is the same in all parts of a series circuit, we now know the current for the entire circuit will be 0.5 amps. Next, we focus on Rx. Since we only want two volts across Rz and the battery is supplying twelve volts, we need a voltage drop of ten volts across Rx (12 volts − 2 volts = 10 volts). We now know the voltage across Rx (10 volts) and the current through Rx (0.5 amps), so all that is left is to use Ohm&apos;s Law once again to calculate the resistance value for Rx. Rx = Vx / Ix = 10 volts / 0.5 amps = 20 ohms. You have now designed a voltage divider circuit. If the scenario were changed slightly so that component Z had a restriction on the current passing through it instead of the voltage, you would redesign the circuit putting a resistor Ry in parallel with component Z instead of in series. This would create a "current drop" in the same way the series circuit created a voltage drop. You would then calculate the value of resistor Ry using the parallel circuit formulas. If you needed to restrict both the voltage and the current, then you would use a combination series-parallel circuit. Easy as 3.14159…, right?